Beer, Training and maybe a little Racing! 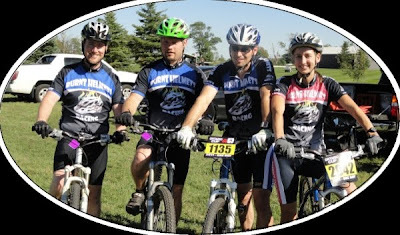 Its March 2012 and after a collective hiatus from racing in 2011 -[ I would mention that the BH Team did compete in a couple races in the 2011 season, specifically the NB Triathlon and the Ontario Cup Provincial MTB Championships in which everyone finished ]- the BH Team is preparing for the upcoming racing season. I've updated the list of races we'll be attending this year, not as busy of a season as past years but definately one packed with good times and simply 'having fun'. I hear a lot of people asking, "So if you weren't racing in 2011 - what were you doing?" The answer is -> enjoying the summer and making some beer! So the focus for 2012 is really on 'Crank the Sheild' with the 'Ride Around the Lake' being the lead-up. Everything else is just "training"! Denis has been keeping fit with his typical off-season activity of playing hockey along with a new activity both he and Amy have gotten into called 'chasing after little Nolan' - something I'm sure will become a fixture in their repetoire of skills. Dave hasn't said much (nor does he usually) about training but I know he is - as the bike found its way onto the trainer positioned in front of the TV in the basement and I've noted fresh sweat stains around the bike on the concrete floor! As for myself, I've been continuing with indoor cycling (Spinning) as well as having added a weekly circut training class. Overall, feeling good and with the recent 'spring-like' change in the weather - itchin' to get riding outside!